We had an unprecedented turn out of volunteers at the Waurn Ponds Creek on Sunday 30 July. Just under thirty participants representing seventeen St Joseph’s families took action on climate change by planting approximately 400 trees as part of National Tree Planting Day. Species planted included; Acacia, red gums, Hop bush, Bursaria, Gynatrix, Calistimon, Casauinas, Vimarias and Clematis. I would like to thank the following families for participating on the day; Gross, Hose, Halik, Hudson-Collins, Katukurunda, McNamara, Miller, Murphy, Near, Pappalardo, Poulter, Ryan, Sager, Salmon, Sweeton, Tatasciore, Wesson. 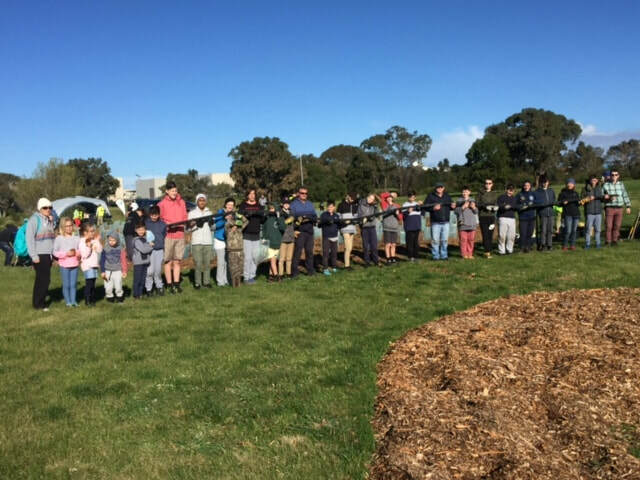 This is the fourth consecutive year the school has supported the event as part of Planet Ark’s Tree day event, funded by COGG (City of Greater Geelong) and FOWPC (Friends of Waurn Ponds Creek Community Group). I would like to congratulate convener FOWPC Rhonda Kelly, Tony Veitenheimer (Buildscape Services), COGG and participating Friends for their tremendous preparation and organisation of the event. Sustainability leaders and Yr11 Environmental Science students will visit the Creek on Wednesday 2 August to support the “Friends” to complete National Tree planting project of 2500 plants, by assisting100 Prep to Grade Two Grovedale Primary School students to plant about 700-1000 ground covering species, including; Dianella, Lomandra, and Poa throughout the site.